The Global Gender Office (GGO) of the International Union for Conservation of Nature (IUCN) congratulates Parties, the UNFCCC Secretariat and all stakeholders on progress toward ensuring that gender equality and women’s empowerment are well-integrated into climate change response at all levels and across all key themes. 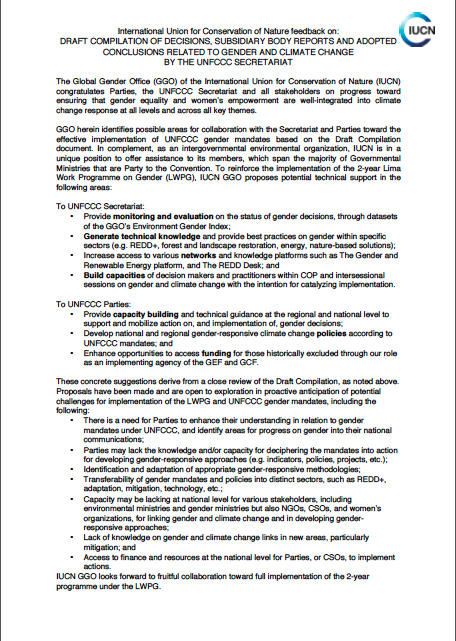 GGO herein identifies possible areas for collaboration with the Secretariat and Parties toward the effective implementation of UNFCCC gender mandates based on the Draft Compilation document. In complement, as an intergovernmental environmental organization, IUCN is in a unique position to offer assistance to its members, which span the majority of Governmental Ministries that are Party to the Convention.